It's a common refrain: change is stressful. At best I think most of us look at change with a quick, nervous glance. At best. 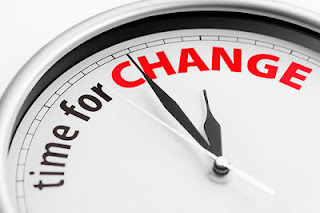 Change, no matter the kind nor the source, no matter whether willful or thrust upon us, is an experience that brings about doubt, trepidation and pressure. I think many of us tend to ponder on all of the possible negative outcomes of a particular change and that's understandable because change invites the unknown to our front door. And Fear of the Unknown seems to be something we're all born with. "What if things turn out better than before?" That simple question would shock me out of my fear-based thinking. At that time it would not often occur to me that some of the roads past change would lead to something better. And over time I've found that 9 times out of 10 I was actually on a far better path than before the feared transition. After several years and many changes and many times having him ask me that question I learned to become quite "change-friendly". For more than a decade instead of change triggering a nervous response it would do the opposite and trigger an excited, energized, positive response. My first instinct is to think how will this change likely improve my life and not spend an inordinate amount of time or energy dwelling in the possibility of darkness that has not yet even occurred. This is an important lesson I aim to impart to my mentees as well as they deal with changes they hadn't expected. It is now the simple question I ask them. Ultimately the result of the change is heavily influenced by your response to it. Even losing a job given the right context can turn out to be a positive thing. One example can be taken from the many stories out there of folks who lost their jobs and were forced to take a step down to find new work. However with less of a rat race pressuring them they've discovered they now have more time to spend with family and that ends up being more important to them. Other folks use an opportunity like a layoff to change their career path and pursue a dream. Your positive response doesn't necessarily lessen the difficulty of dealing with change but does increase the probability of getting a positive result. As we close out another year and journey into a new one with some of us promising to change and others about to be in receipt of change I wish you all a healthy, happy and peaceful year with nothing but 365 positive results. On numerous occasions on this blog I've discussed how critically important questions are in mentoring, in communication, in building a career and in life. I recently ran across a superb article giving tips on how to (and more importantly, how not to) ask questions. Whether using questions to learn new information, deal with confrontation or simply to educate you will significantly increase the chances of reaching your goal if you follow all the advice in the article "The One Conversational Tool That Will Make You Better At Absolutely Everything". The article could easily be retitled "The Art of the Question" but it's current title is quite apt. If you read nothing else today I strongly suggest clicking over and taking a comprehensive look at asking great questions.